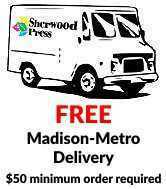 Sherwood Press has all the bells and whistles! Sherwood Press offers a variety of customized finishing options. Contact us or call with ideas! Page Summary: Sherwood Press offers folding, binding, drilling, stitching, scoring, laminating, padding, numbering, perforating, trimming in Madison, Sun Prairie, Monona, Windsor, Waunakee, McFarland, De Forest, Fitchburg, Cottage Grove, Oregon and surrounding Dane County communities.